I thought I’d take a pic or two of the winter planters I’d done….but then Gloria thought she’d take a swipe at the berries on the gaultheria…..see swiftly moving hen aiming for red berries. OK so I shooed her off and tried again. 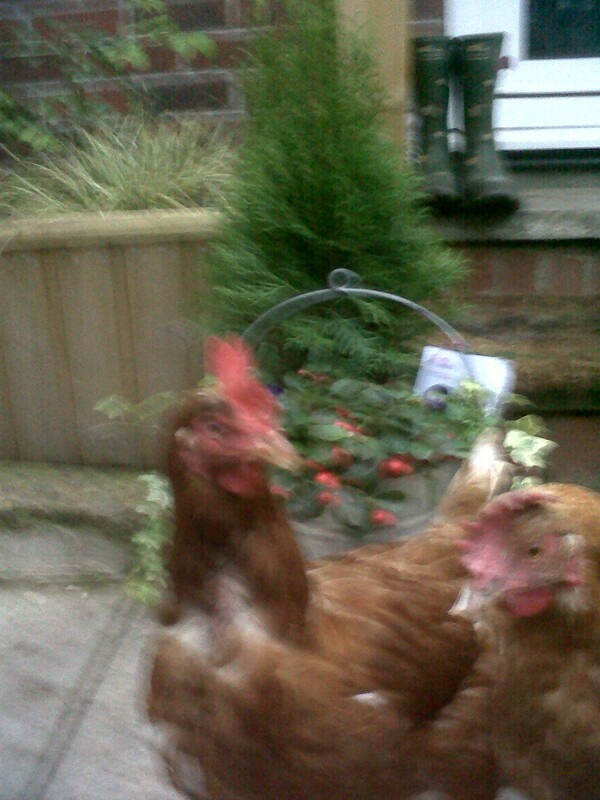 No hens to be seen, great, point the camera at the planter and ……peck! Straight at the phone..Gloria and her friend this time. “Is it edible, no, well let’s have another peck anyhow”……..so I gave up till they were in bed…but of course then it was dark. You can’t win sometimes. Hopefully you can see what we have here though. A full sized old fashioned zinc pail filled with a 2ft conifer, gaultheria which has lovely red berries flowing over the front, with trailing ivy and pansies or violas All should do beautifully well on your doorstep all winter. Put a string of battery operated lights round the little tree and you’ll have a lovely Christmassy welcome on your doorstep later in the winter as well. And if you want to you can plant everything in the garden when it gets too big for the bucket. Don’t panic though the thuja (confier) is slow growing so you’re not looking at a hugenormous monster like leylandii! So here it is in the dark. Difficult to see I know but I hope you get the idea! The buckets cost £30 delivered to Leeds postcodes and the Pontefract/Castleford areas. Please get in touch via the contact form on the site if you’d like one. I deliver little planters as well but it’s way too dark to take any pictures now. Will have a go tomorrow. 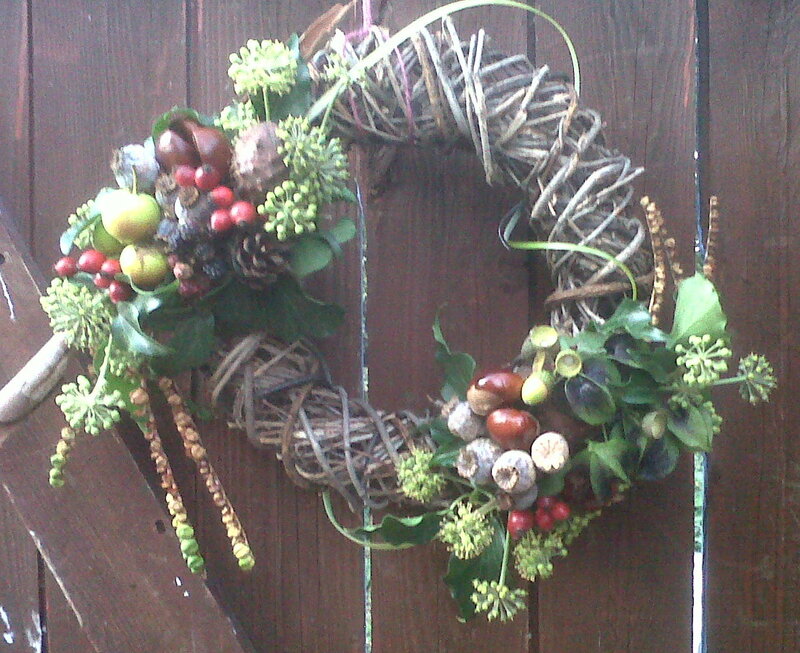 The base is a wicker frame decorated with seed heads and berries from the garden and the hedgerow. The frame itself will last for several years so you can decorate it again every season if you want to, and the berries and greenery will last outside for many weeks….the colder it gets the longer they’ll last! There are some advantages to the cold weather. 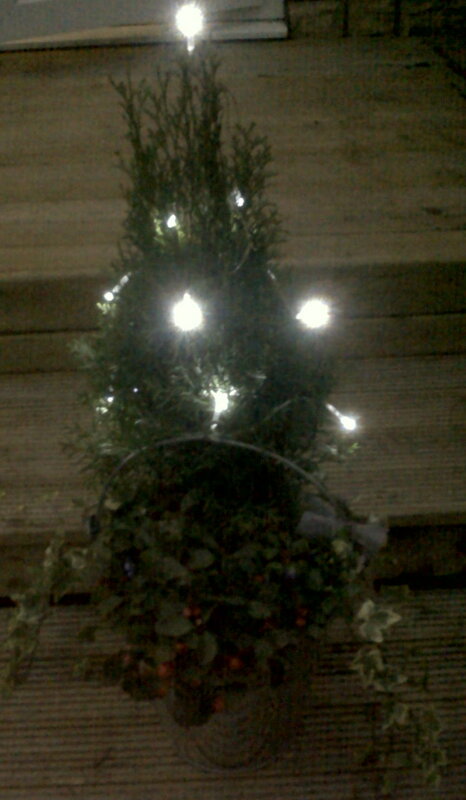 Delivered to the same areas as the planter the wreath will cost £28.00. I have no idea when I’ll be able to take orders on line (I’m sorry)…. technology and I fight daily. So if you’d like either the planter or the wreath drop me a note – just click on contact in the menu bar and drop me a line.